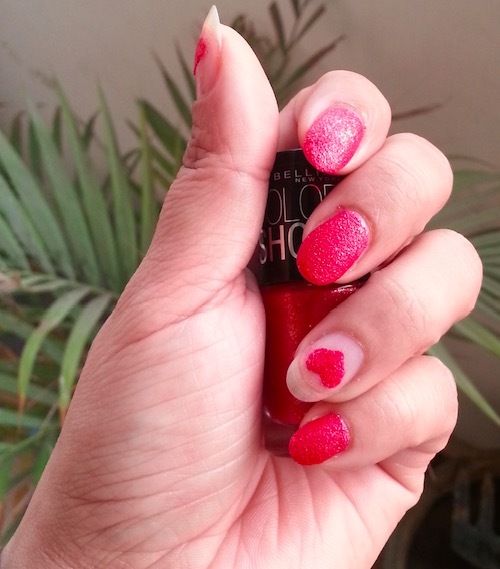 Hey everyone, today I’m reviewing the Maybelline Color Show Glitter Mania Nail Polish in shade Red Carpet 604. I absolutely love Maybelline Glitter Mania nail paints and owned all the shades available. 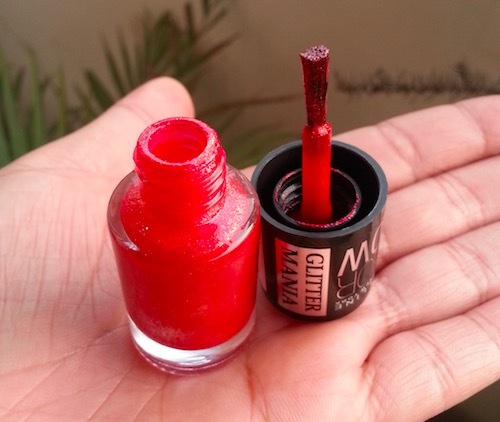 I’ve already reviewed Maybelline Glitter Mania All That Glitters. Shades Available : It is available in 8 gorgeous shades – Starry Nights, Paparazzi Purple, All That Glitters, Red Carpet, Matinee Mauve, Dazzling Diva, Pink Champagne and Bling On The Blue. Packaging : The nail polish comes in a clear glass bottle with a black cap and the shade name is given on the top of the cap. The bristles of the brush are of good quality which make the application smooth & fuss-free. I really like its compact, sturdy and travel friendly packaging. 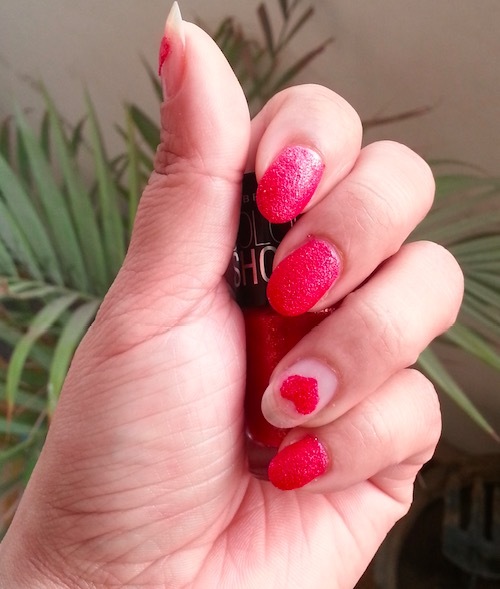 Red Carpet is a beautiful red color with a loads of red, pink and gold shimmer particles. 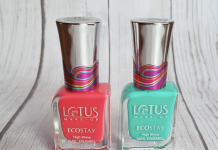 It is highly pigmented and goes opaque in just one stroke and two coats are good enough to give sparkly textured look to your nails. It dries pretty fast and there is no need to wait in-between the coat applications. 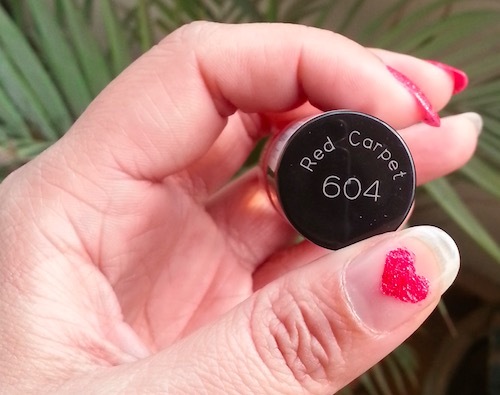 It instantly brightens up my hands and stays on my nails for up to 5 days without chipping. This color will look good on all skin complexions and is a must have product in the bridal makeup kit. 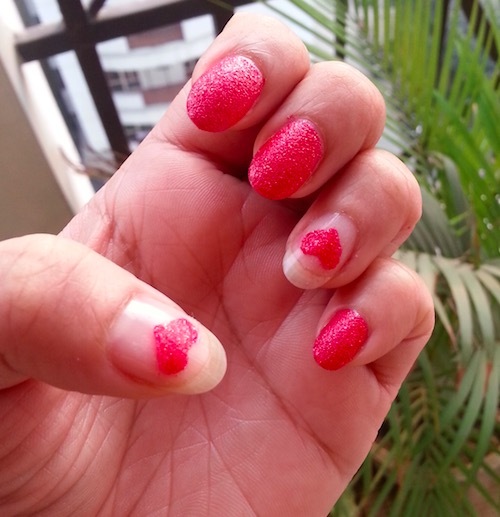 It can be easily removed with a good quality nail paint remover. It is very affordable and I’m extremely happy with the quantity and quality provided for its price. 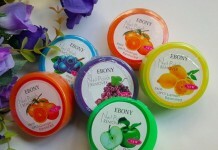 It is easily available at the local beauty stores and online shopping websites. 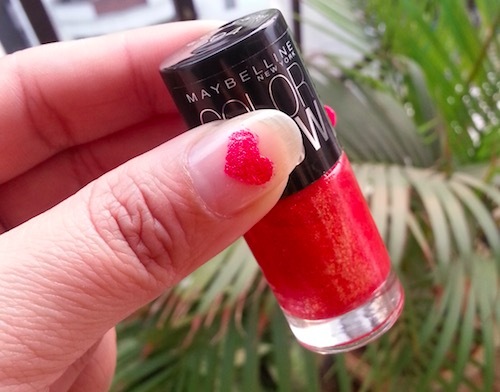 Claims : Let your nails dazzle and shine with MNY Color Show Glitter Mania nail color range. Priding itself as India’s first-ever textured nail paint, the Color Show Glitter Mania range is every nail-art lover’s dream! When applied, these sparkling nail colors deliver a 3D shimmering effect, adding oodles of style to your tips. They also have a unique sand-textured effect that looks and feels great on your nails. With 8 glittering nail color shades to choose from, you’re sure to find the perfect shade for every mood. 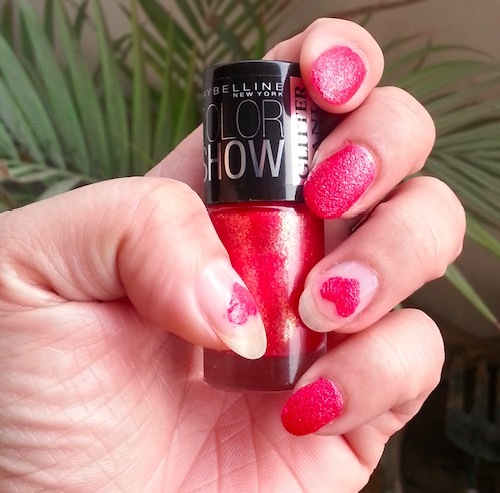 I absolutely love Maybelline Color Show Glitter Mania Red Carpet nail polish. 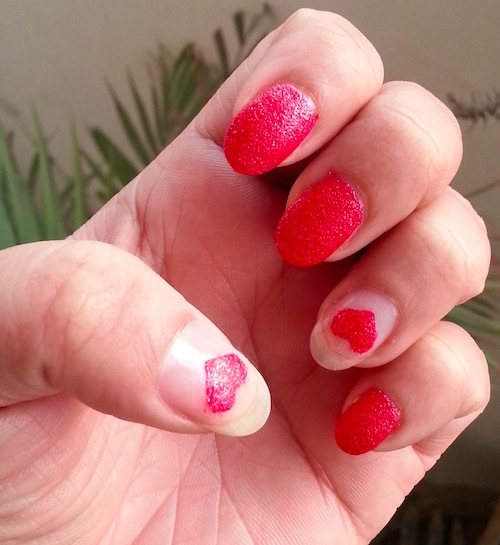 It is gorgeous red color which instantly brightens up my hands and stays on my nails for long time. Highly recommended!